Jean Charles Duffaut, Memory, 2012, acrylic 24 x 18 inches. MoFA is proud to announce that our Generations exhibition is underway! The exhibition traces artistic legacy and was curated by teachers from 14 schools with the curator of education at MoFA. Representatives from other Tallahassee organizations also joined the team. Benefiting from their teachers’ hard work, MoFA is hosting school children during the opening days of the exhibition. As part of the activities planned in conjunction with the exhibition, Dr. Preston McLane, attorney and FSU Art History Department faculty, will be moderating a conversation with Jean Charles Duffaut, one of the artists in the exhibition. This event will take place on Thursday, May 16th from 7-8pm at the museum. Amongst the artists are FSU faculty and instructors: Carrie Ann Baade, Ananda Balingit-Lefils, and Trevor Bell. The exhibition runs through July 12th and there will be a reception held on Friday, May 24th from 6:30 to 8pm. Closed: May 27th and July 4th. 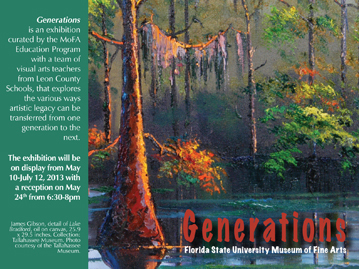 Generations is an exhibition curated by the MoFA Education Program with a team of visual arts teachers from Leon County Schools, that explores the various ways artistic legacy can be transferred from one generation to the next. 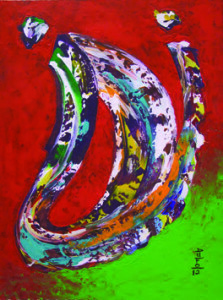 The exhibition will be on display from May 10th through July 12th, 2013 with a reception on May 24th from 6:30-8:00pm. Image: James Bison, detail of Lake Bradford, oil on canvas 25.9 x 29.5 inches. Collections: Tallahassee Museum. Photo courtesy of the Tallahassee Museum.